Below is a message from NSA Boston Chapter Member, Rébecca Kleinberger, inviting you to participate in a study that she is working on at the MIT Media Lab. Feel free to read her message below and consider participating if this interests you! 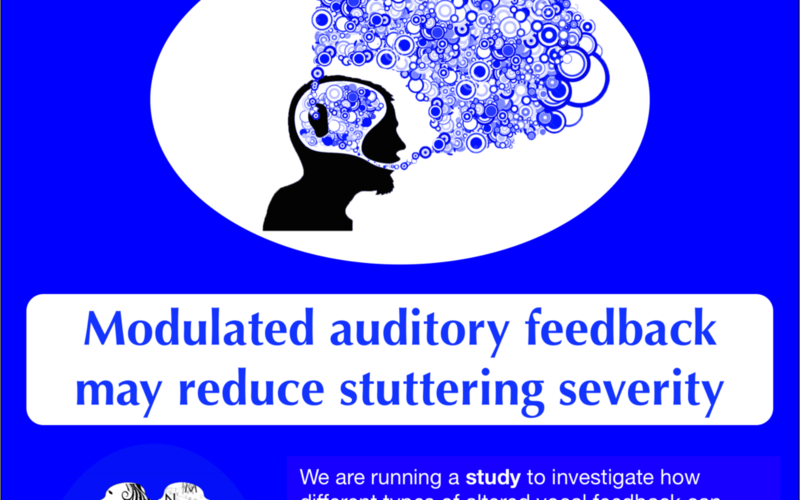 Rébecca Kleinberger and colleagues at the MIT Media Lab in Cambridge are recruiting for a study exploring the effects of “musicalized” auditory feedback on fluency in persons who stutter. 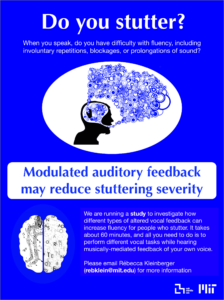 Subjects will complete a series of speaking tasks (e.g., reading out loud, repeating phrases, telling a story) while their voice is transformed in several different ways and played back in real-time. The study takes about 60 minutes, and most have found it interesting and enjoyable! If you stutter, are 18 or older, and are interested in participating — or just have questions about the project — please email Rébecca (rebklein@media.mit.edu). Feel free to pass along this email to others who might fit those criteria and might be interested!